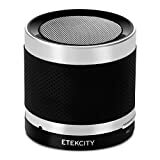 The Etekcity Roverbeats T3 features a very strong Bluetooth 4.0 connection as well as a supplemental AUX port. Having multiple types of connections available allow the T3 to sync to a variety of devices. The Roverbeats T3 is only 2.5” in diameter and height, but thanks to its high damping paper diaphragm, this speaker can unleash surprising amounts of sound. Don’t be afraid to crank up the bass, the diaphragm is designed to handle the load.